Twitter Adds Transparency Tools: In the era of fake news, bots and manipulated social trends, Twitter is under pressure to add tools to their social network that help average people discern what’s authentic and what’s manufactured. This week Twitter has rolled out a change to Moments that would provide contextual information within its curated stories, called “Annotations.” They also announced they will hide reported tweets behind an informational notice and make it more transparent to users whether a deleted tweet was deleted by the user or because Twitter took an action. Humans Can’t Stop Rear-Ending Self-Driving Cars: Autonomous car manufacturers boast of their safety standards and conservative approach to the road – aimed at reducing the nearly 40,000 fatalities that hit US roads every year. But as we live in the paradox between all-human-drivers and all-robot-drivers we’re entering a long phase where we share the road together, and the headaches are piling up. Specifically, two-thirds of all autonomous vehicle accidents are human drivers rear-ending them. The reason? Humans expect other humans to bend or break traffic laws, and the robots just don’t act that way. For now, Wired says we should give self-driving cars a lot of stopping distance, don’t expect them to accelerate through yellow lights, and hope the time comes soon when they can drive us to work while we nap. College Students Relying on Snapchat for News? A new study from the Knight Foundation turned up a surprising finding — that among college students, Snapchat is the second most popular social media source for news behind Facebook. 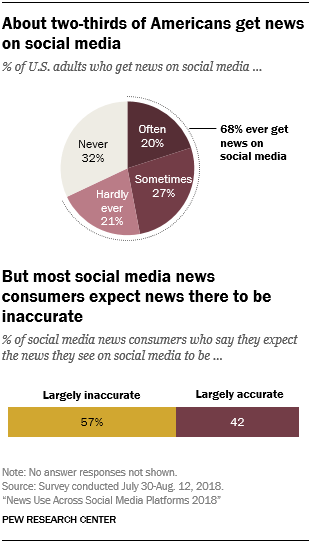 Of those surveyed, 89% said they got at least some of their news from social media over the previous week, with Facebook the most popular outlet (71%) and Snapchat second (55%). In contrast, the Pew Research Center has found around 5% of US adults get their news from Snapchat — a number that has remained consistent over the last two years. Wile E. Coyote is So Hot RN: We’re seeing Looney Tunes’ underdog villain Wile E. Coyote everywhere right now — as the centerpiece of Raf Simons’s latest collection for Calvin Klein (this $1,400 leather tote!! ), The Hundreds’ ACME collection, and soon to be in his own animated movie with “Lego Batman” director Chris McKay on board to produce. Could this be the era where the Coyote captures the Road Runner? Doubtful. Related: Here’s our favorite Wile. E. Coyote meme. Product Wars: A Short Film: In this new short film from Stephan Zlotescu, genetically engineered mascots become the latest craze in this all too possible future. The film takes us into an alternate history where mascots and marketing characters are genetically manufactured to actually exist. This is the most exciting, depressing, and provocative 8.5 minutes you’ll spend this weekend. Or your money back! Watch it here.